The NJSBA Board of Directors met on Friday, January 18, 2019, at the Association’s headquarters in Trenton. Nominating Committee Update: NJSBA Nominating Committee received 12 applications for four association officer positions. Available positions include president, vice president for county activities, vice president for finance, and vice president for legislation/resolutions. Candidate interviews will be conducted on Friday evening, February 8 and Saturday, February 9. The Nominating Committee will present a slate of candidates for election at the Association’s Delegate Assembly on May 18, 2019. Executive Director’s Report Dr. Lawrence S. Feinsod, provided an update on NJSBA activities and progress toward the goals of the current strategic plan. School Board Recognition Month – January is School Board Recognition Month in New Jersey. Since 2003, New Jersey’s governors have issued proclamations recognizing the work of local boards of education by declaring January as School Board Recognition Month. At the State Board of Education’s January 2nd meeting, President Dan Sinclair and Dr. Feinsod accepted a resolution honoring New Jersey’s 5,000 board of education members. NJSBA Equity Council – The Equity Council consists of board members and experts in various fields. It will advise the Association and local school boards on research and best practices in curriculum, educational opportunity, school climate, policy and other areas. On December 10, approximately 20 people participated in the Equity Council meeting, where issues of fairness and justice for students were discussed. Going forward, the council plans to feature occasional articles and equity issues and resources for our members in School Board Notes. The Council is chaired by Dr. Penelope Lattimer of the Rutgers Institute for Improving Student Achievement. NJSBA Mental Health Services Task Force – At the December task force meeting, the members heard from Dr. Maurice Elias, director of the Rutgers University Social-Emotional Character Development Laboratory. Dr. Elias is one of the nation’s leading experts on school climate. The task force is scheduled to issue its final report in late spring. Career-Focused Learner – The final report on Education Opportunities for the Non-College-Bound Learner was issued in October. To raise awareness of the task force’s findings and recommendations, NJSBA is engaging educational, government and business organizations – including the New Jersey Council of County Vocational-Technical Schools. A second meeting with NJCCVTS was held on Monday, January 14. Developing and Maintaining Relationships – The NJSBA Strategic Plan calls for the Association to develop and maintain relationships with new staff at the Department of Education and members of the State Board of Education. On Wednesday, January 16, President Sinclair and Dr. Feinsod welcomed Commissioner of Education Lamont Repollet and members of his senior staff to Association headquarters. Current partnerships with the NJDOE, including Future Ready Schools-New Jersey, the department’s participation in Workshop, and other activities were discussed. Additional avenues of collaboration are also being explored. This year, NJSBA and the New Jersey PTA will again co-sponsor the Annual Legislative Day on May 16, 2019 at the War Memorial in Trenton. Training – Over the past year, a new leadership weekend was instituted titled, GPS for Visionary Leadership. This year’s leadership weekend, which will be fully funded through donations from corporate New Jersey is scheduled for the first weekend in May. In 2018, new Board Member Academy training included programs on school funding, special education, and cyber-security. I-STEAM programming has also been expanded. Much of the I-STEAM training and consultation is conducted in partnership with the U.S. Army. Currently, we are exploring the possibility of establishing a similar partnership with the U.S. Air Force. Advocacy Update: The Governor’s budget address is scheduled for March 5. Governor Murphy has pledged to provide money for public education, but has offered no details. His budget address is scheduled for March 5. On January 17, the NJEA conducted a rally in support of three pieces of legislation that would (a) limit the ability of local district to subcontract non-instructional services; (b) extend tenure-like protection to non-teaching staff, and (c) eliminate the “Chapter78” employee contributions to health coverage. NJSBA will continue to advocate against these proposals. Other Business: The Board of Directors recognized Brandon Pugh, who is retiring from the position of vice president for legislation/resolutions. The board also welcomed new members Steven Seavey, Monmouth Regional, representing Monmouth County; Daniel Leonard, Toms River Regional, alternate representing Ocean County, and Scott Nodes, Greenwich Township, alternate for Warren County. Received reports from president, immediate past president, vice president for county activities, and vice president for finance. Engaged in a dialogue about Arts in Education. Information items included Association financials, Bylaws Committee Report, GO/4153.1R – Sick Time, Legal Case Summary, schedule of NJSBA holidays (July 1, 2018-June 30, 2019), Governor’s proclamation for School Board Recognition Month, and the State Board of Education’s resolution recognizing January 2019 as School Board Recognition Month. 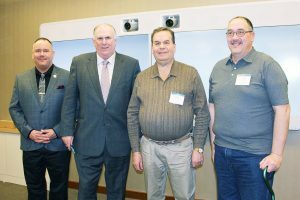 At the Jan. 18 NJSBA Board of Directors meeting, three new members took the oath of office. Left to right, Daniel Leonard, from the Toms River Regional Board of Education, alternate member for Ocean County; Dan Sinclair, NJSBA president; Steven Seavey, from the Monmouth Regional High School Board of Education, alternate member for Monmouth County; and Scott Nodes, from the Greenwich Township Board of Education, alternate member for Warren County.